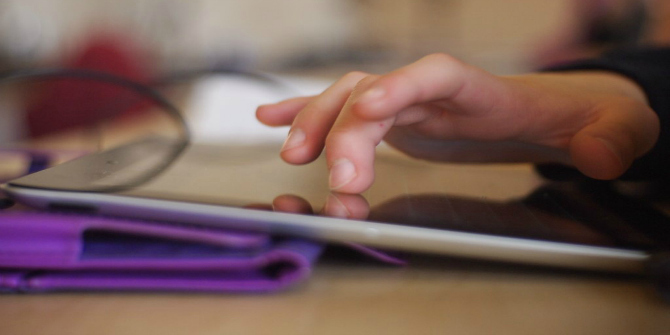 Based upon fieldwork at a London school, The Class: Living and Learning in the Digital Age is a new study of how adolescent learning and identities are being shaped by the digital world, both within and beyond the classroom. This instructive book from Sonia Livingstone (LSE, Media and Communications) and Julian Sefton-Green (LSE, Media and Communications) offers valuable insights that will be of use to those working in the fields of education, sociology and adolescent psychology as well as teachers and parents looking to better understand and engage with adolescents in their classrooms and their homes, writes John V. Maldonado. This review originally appeared on the LSE Review of Books. The Class: Living and Learning in the Digital Age launched at LSE in The Shaw Library on Wednesday 22 June 2016. The Class: Living and Learning in the Digital Age. Sonia Livingstone and Julian Sefton-Green. New York University Press. 2016. 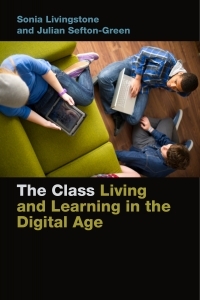 In The Class: Living and Learning in the Digital Age, Sonia Livingstone and Julian Sefton-Green’s collaborative efforts provide an instructive account of the ways in which adolescent learning and identity are shaped by digital media in the twenty-first century. The authors challenge the pervasive outcries of policymakers, parents and educators over ‘obsessed youth […] lost in the digital world’, and find that members of their book’s titular class are using new forms of communication and expression to engage in interactions that are parallel to those experienced by their pre-social media counterparts (55). The Class tracks a group of Year 9 students at London’s Victoria Forest School over three semesters in an attempt to determine how students build their identities within the spheres of family, school and friendship, as well as how these spheres are interconnected. In light of these overarching goals, three significant themes emerge and are addressed at various points throughout the book: how students in the class create and sustain their identities; the separation between the spheres of family, school and friendship; and the role of digital media as it pertains to daily living. A particularly poignant profile of the pseudonymous Megan in the book’s fourth chapter, ‘Identities and Relationships’, provides a view into the numerous situational identities that youth build for themselves. Megan is simultaneously a ‘daddy’s girl’ whose whims are indulged by her father and an obedient daughter to a mother with high expectations; ‘ostentatiously’ defiant toward her teachers and a student with good grades; and best friends with two females outside of the class and (by her own admission) disliked by her female classmates (90-91). Megan’s juxtaposed identities are a striking example of the ways in which youth compartmentalise their various selves in order to all at once conform with, and disconnect from, expectations held by adult authority figures or their peers. Megan’s example serves as an important precursor to the exploration of the fragmentary coexistence of school, family and social lives that adolescents experience, as the authors seek to identify the ways in which these spheres exclude each other. Due to its location in an urban setting and resulting diverse student body, Victoria Forest School places heavy emphasis on ideas that it views as civil, such as behaviour codes and manners. However, the same civility that attempts to create an environment of impartiality and equality also ‘[contrasts] with – and deliberately [excludes] – the young people’s out-of-school experiences in family or peer contexts’ so as to avoid messy conversations about social and economic inequality (108). The result is that in-school relationships are built to avoid conflict and ingrain inclusivity in ways that, for better or for worse, ignore the effects of personal circumstance. The family sphere excluded school in a similar way. Livingstone and Sefton-Green found that learning in the home was supported in myriad ways, though parents generally attempted to provide their children with more cultural and creative engagement than the kind of measurable, achievement-based learning that happened in school. Furthermore, the inequity that Victoria Forest School distanced itself from greatly influenced the kind of learning that took place in the home, so much so that the authors caution against ‘the undoubtedly exciting calls to reimagine education in ways that rely on families to support and extend learning, for these risk exacerbating socioeconomic inequalities’ (189). Perhaps the most interesting results that come out of The Class have to do with the exclusivity of the adolescent social sphere and the selves that youth construct within this one sphere alone, leading to varying levels of public and private activity. This activity provides important insights into the kinds of social interaction that adolescents desire, the ways in which digital media allow them to manage these interactions and the vast differences between perception and reality as they pertain to the social priorities of today’s adolescents. As several case studies of students in the class suggest, today’s youth value different kinds of interactions to varying degrees; they use various digital media to delineate between interactions based on their importance, and in ways that do not necessarily detract from face-to-face communication. Returning to the example of Megan, we see the very intricate way in which youth manage their social networks through digital media. Megan used Facebook in order to attain information regarding opportunities for face-to-face interactions with peers (e.g. parties, social gatherings, etc). She also gave her password information to friends as a sign of intimacy, even though Facebook was seen as the most public form of communication from which no truly intimate details could be attained. She reserved her private communications for Twitter messaging, and did not share that login information with peers. Megan’s most personal and protected space, however, was her Tumblr, which she kept hidden from even her closest friends, and which allowed her the most opportunity for aesthetic self-expression and identity creation. For Megan, Tumblr is simply a technologically-based manifestation of the same private space that pre-social media adolescents would create in their personal journals. Social media is also seen by adolescents as a substitute for the face-to-face interactions that they would prefer to have but are unable to ‘because of parental fears for their safety, the cost of public transport, the lack of bicycle lanes or affordable places to meet up’ (79). In fact, the vast majority of the class strongly preferred to have face-to-face interactions with friends and family. Restrictions on physical proximity to friends, whether imposed by parents or due to a lack of resources, forced youths to find other ways to engage with their friends. It is through this realisation that Livingstone and Sefton-Green make a point that parents, educators and policymakers should note and consider in light of the ubiquitous ‘public hyperbole about digital media’: that face-to-face conversation is being reframed, not replaced, by today’s youth (104). Adolescents are now saving their most authentic, profound and private interactions for the very limited amount of face-to-face communication that they can create away from the observation of parents or the school environment. Rather than engaging in a so-called digital obsession, today’s adolescents are utilising digital media for less meaningful, interstitial communication until they are able to spend their time as they prefer – in the presence of friends and family. Teachers and parents will find Livingstone and Sefton-Green’s microcosmic look into the lives of today’s youth instructive and helpful in attempting to understand and better engage with adolescents in their respective classrooms and homes. Researchers in the fields of education, sociology and adolescent psychology will find that The Class lends itself to many branches of further scholarship, and is an exciting prelude to even more ambitious work on relationship- and identity-building in the digital age. John V. Maldonado is a doctoral student at Fordham University and teaches literature at Archbishop Molloy High School, a Marist preparatory school in New York City. His research interests pertain to the interplay between literacy learning, instructional technology and differentiation in general and special education classrooms.